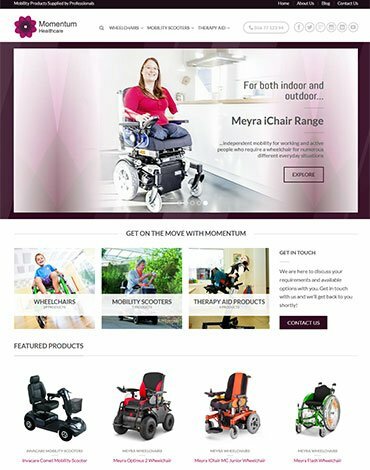 Our latest website design Kilkenny project is for Momentum Healthcare who have a well-deserved reputation as one of Ireland’s leading suppliers of wheelchairs, mobility scooters, and therapy aid devices. The company is renowned for its supreme levels of personal attention and expertise. An existing website did not properly reflect such levels of professionalism however, and company owners Peter and Aisling Carroll decided it was time for an upgrade. That was when we got involved. In a series of client meetings and conversations, we gathered details of the scope of the Momentum Healthcare range and the extent of online traffic for such products. We established that their unique selling points include not only unsurpassed levels of personal attention and after-care, but also their status as exclusive distributors in Ireland of some of the world’s leading wheelchair brands. A senior copywriter was assigned to the project, to compile product descriptions of more than 40 wheelchairs, mobility scooters, and other therapy devices, all in a coherent and consistent style while drawing data from various sources. Other content produced included an inspiring ‘About Us’ piece, several blog posts, and profile pieces on two pioneering wheelchair users who are happy clients of Momentum Healthcare: tennis player Garreth Greene (aiming to qualify for the 2016 Paralympics in Rio De Janeiro), and adventurer and author Mark Pollock, who became wheelchair-bound as a result of an accident, and who is making medical history in the quest for a cure for his paralysis. Once the content was agreed, we moved on to the build. A balancing act was crucial to this website design. On one hand, we needed to inform of the therapeutic and essential mobility benefits of the wheelchairs and other products in the Momentum Healthcare range. On the other hand, the overall look and ‘feel’ of the site also needed to spread the core Momentum Healthcare message that an active and enjoyable lifestyle is still possible for people of limited mobility, once they have the correct equipment. We achieved this through strategic use on the home page of large sliders featuring lifestyle images, and accompanying text extolling the benefits of those particular products. Other elements of the home page and throughout the site are also active in nature, helping to avoid the sterile and ‘medical’ feel of other websites featuring the same types of products. Wheelchairs, mobility scooters, and other therapy aid devices were grouped together in user-friendly format, while search filters were also added to make it easier for users to find products suitable for themselves. Other aspects of the website design and build included sourcing and processing more than 500 images and more than 100 PDF documents for download. Meanwhile, more than 300 redirects from the previous version of the website were carried out, to retain lingering SEO value from there. Finally, while the website was built in brochure website nature, back-end functionality was included for easy transition to full ecommerce status in the future, should the clients so desire. Just click here to see the finished product – and how we got Momentum on the move.